Webroot SecureAnywhere Complete (WSC) 2013 has proven more efficient and faster in detecting and removing malware threats compared to its competitors. It supports Windows, Mac OS, and even mobile devices with all round security. It also includes 25 GB of hosted online backup where you can upload your important files and photos securely. The installer file size of WSC 2013 is so tiny that you can email it as an attachment and the installation process completes under a minute without any problems which is ultimately impressive. A scan is performed as soon as the whole process is completed. WSC 2013 has another impressive thing i.e. its interface. It has light-green color font for highlighted words. It includes six tabs namely Overview, PC Security, Identity & Privacy, Backup & Sync, System Tools, and My Account. Antivirus, Antispyware and Anti-Phishing engines to remove viruses, spyware, malware and other online threats without affecting your system’s performance. It defends your Mac OS from Mac Trojans and other PC threats. Next Generation Firewall – Detects and blocks potentially harmful network connections using the cloud. Identity and Privacy Protection – Encrypts your website login credentials and synchronizes your devices when shopping or banking online and prevents cyber criminals from stealing your personal information. Anti-Phishing Protection – Notifies you of malicious and fake websites that try to access your personal data. Social Network Protection – Checks the URLs shared on Facebook and Twitter and blocks them instantly. Mobile Internet Security for iPhone, iPad and Android devices. Password Protection – Encrypts passwords while shopping or banking online. System Analyzer and Cleaner – Diagnoses and cleans away your PC problems, registry errors, duplicate files, maintains privacy and fixes security holes. Online File Backup – Upload your photos, documents, music and other important data to 25GB online storage. 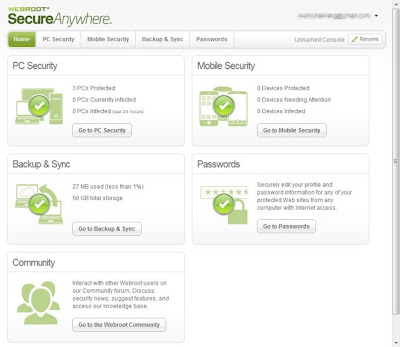 Manage your Webroot SecureAnywhere account online from the program itself. Free Technical Support for WSC customers. Compatible with Windows 8 operating system. 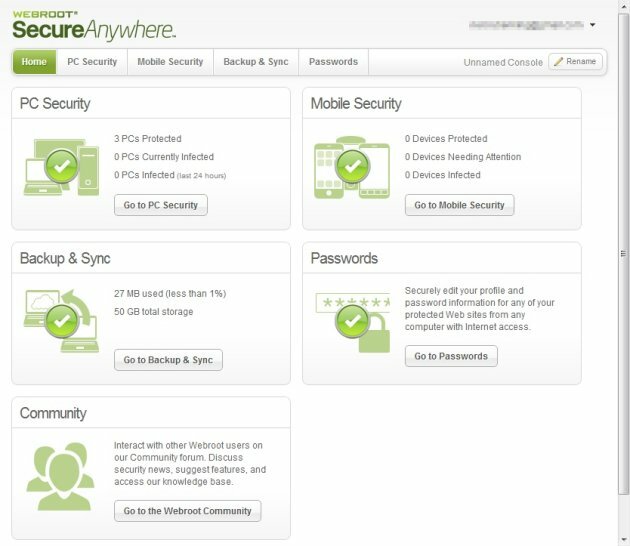 Webroot SecureAnywhere 2013 misses the spam filtering, parental control features and the Anti-phishing component is not very accurate in blocking threats. 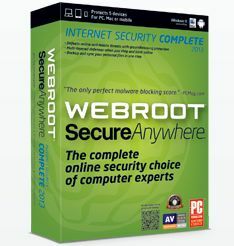 But it has all the other internet security features packed in small, lightweight application. Download Webroot SecureAnywhere 2013 14 day trial or purchase it for $80.